How has the cause of monarchy fared around the world in 2012. As is often the case, it has been something of a mixed bag. In Sweden, HM King Carl XVI Gustaf came under fire for some bad behavior and unsavory company that caused quite a lot of embarrassment. However, it was shuffled off the front-page by happier news with the birth of a future queen when Crown Prince Victoria and Prince Daniel welcomed their daughter Princess Estelle into the world in February. Later, in October, Princess Madeleine of Sweden announced her engagement to live-in boyfriend Chris O’Neill of New York. Across the border in Norway, the Royal Family went about their duty with no fuss or major problems. A poll taken found the King of Norway with an approval rating of 93%, a feat no politician could ever hope to match. Many royals had problems in 2012. In April His Catholic Majesty King Juan Carlos I of Spain broke his hip while on a hunting trip in Botswana and rather than an outpouring of sympathy from his people he was met with a tirade of anger and abuse -because he had been hunting. Things reached such a fever pitch that the King himself had to issue a formal apology to the nation. Things were also made difficult by the allegations of wrong-doing aimed at the King’s son-in-law and HM Queen Sofia was denied permission to attend the Diamond Jubilee festivities in London because of lingering Anglo-Spanish tensions over Gibraltar. All in all, 2012 was not a good year for the House of Bourbon. We can only hope this year will be better. There were scares and tragedies for others as well. In February, Prince Johan Friso of The Netherlands was buried in an avalanche while skiing in Austria, was nearly killed, and his been mostly comatose ever since. Doctors have hinted to the family to prepare for the worst but at other times seemed more encouraging. Twice during the year HRH Prince Emanuele Filiberto of Italy had to be hospitalized to have cancer removed though thankfully he has bounced back after each procedure. On the other side of the world, His Majesty the Emperor of Japan underwent heart bypass surgery in February, came through it well enough, was released but later had to return to the hospital to have fluid drained from his chest. His duty schedule was shortened as a result with HIH Crown Prince Naruhito happy to take on more work to ease the burden on his father. There was more tragedy for the Imperial Family when the colorful and often out-spoken Prince Tomohito of Mikasa passed away in June. One of the most prominent and ever-present royal figures in Southeast Asia departed this life when HM King-Father Norodom Sihanouk of Cambodia passed away in October after many years of worsening health. Most Cambodians alive today cannot recall a world without him. In Europe, 2012 was a year of re-burials in the Balkans. In October the late Prince-Regent Paul of Yugoslavia was moved from France to be reburied in Serbia and in November, also coming from France, the remained of Ahmed Zog, the President-turned-King of Albania was brought home for a formal reburial in his native land. One could certainly not call any burial or reburial a happy occasion but such ceremonies do serve to remind the people of their royal history and give a little taste of the traditions that have been lost with the politicians republics that exist today. 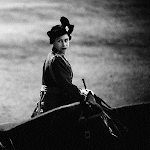 However, there was happy news as well, thankfully, and for monarchists nothings is better than weddings and coronations. In October HRH Hereditary Grand Duke Guillaume of Luxembourg was married to Belgian Countess Stephanie de Lannoy, and even the United States got in on the royal wedding scene in September when HIRH Archduke Imre of Austria married Kathleen Walker in Washington DC at a very traditional but low-key traditional Catholic ceremony (“traditional” as in Latin, the language of God and the Caesars). And, on the other side of the world, in April HM Sultan Abdul Halim Mu’adzam Shah of Kedah was (for the second time) formally enthroned as the King of Malaysia or “Yang di-Pertuan Agong” (He Who Is Made Lord) with all appropriate pomp and ceremony. Wedding bells will also soon be ringing again in the Principality of Monaco as in June Andrea Casiraghi (eldest son of Princess Caroline) announced his engagement to long-time girlfriend Tatiana Santo Domingo who later announced her own pregnancy. Okay, so they didn’t get it in the proper order but happy news all the same. Monarchists also smiled when the Prince of Monaco sued French newspapers for libel over their effort to ruin his wedding with their gossip-peddling (good for him) and in some really great news for monarchists, in July the good people of Liechtenstein voted by a margin of over 70% that their Sovereign Prince should retain his power to veto legislation. Hoech! Hoech! Hoech! And of course, for the English-speaking world at least, it is the House of Windsor that always tends to dominate royal news and this was entirely appropriate for 2012 as not only was there a great deal going on but it was also the year of the Diamond Jubilee with HM the Queen celebrating 60 years on the British throne and the thrones of all the other Commonwealth Realms. The Queen visited Northern Ireland in June, opened the Olympics in July (“parachuting” in with James Bond -I’m sorry I still think that was tasteless) and taking in a river parade for her anniversary celebrations that went well despite the botched coverage by the BBC. The Duke and Duchess of Cambridge, as well as the Prince of Wales visited Australia and New Zealand, Prince Harry made a splash in the Caribbean in March and then in August caused a tempest in a tea pot by his partying in Las Vegas (I hear there was gambling going on too!) but this only brought about a wave of popular support for the picked on party animal. HRH the Duchess of Cambridge was announced to be “with child” and politicians eager for distraction embraced the cause of changing the law of succession to allow royals to marry Catholics and to replace gender discrimination with age discrimination. Not too thrilled about that but, on the whole, 2012 was a good year for the House of Windsor I think with the Olympics and the Jubilee stirring up a little healthy patriotism and the Queen, the Duke and Duchess of Cambridge and Prince Harry as popular as ever. Even the Prince of Wales seems mostly in the good graces of the public, even if he still thinks the environment is going to kill us all. 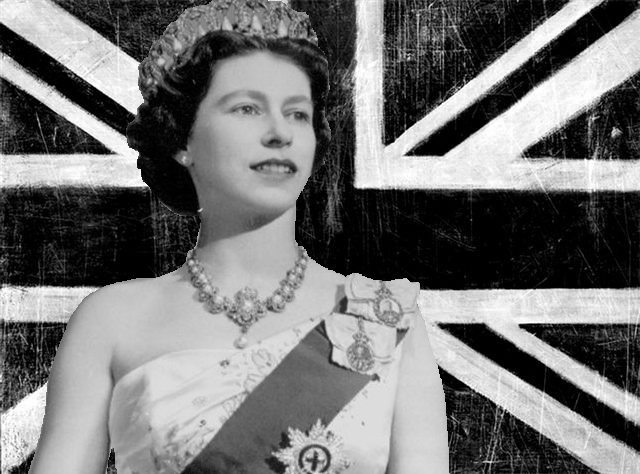 The Diamond Jubilee certainly was the biggest royal-related story of the year and helped bring a great deal of more positive coverage in a year that, otherwise, saw a great deal of problems. Hopes for restorations in North Africa were not fulfilled, the Kings of Sweden and Spain came under unprecedented criticism, agitation and riots throughout the year troubled the Kingdom of Jordan and several Gulf monarchies, there was a tragedy for the House of Orange and monarchs struggling with fragile health in Saudi Arabia, Thailand and Japan. 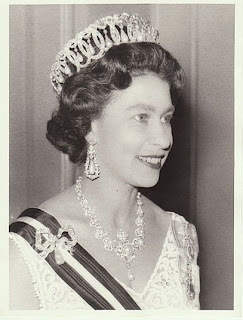 However, at least in those countries support for the monarchy remains strong and there was good news of weddings, weddings to come, babies to be born and, because of the Diamond Jubilee, a number of royal visits by members of the House of Windsor to realms around the world and there is nothing like a royal visit to make royalist sympathy stronger. So, all in all, it was a good year for some, a rather terrible year for others but, on the whole, I would say a little more into the positive zone. Other years have certainly been worse but we can hope that 2013 will be better and that we will have nothing but good news to talk about. No harm in hoping. 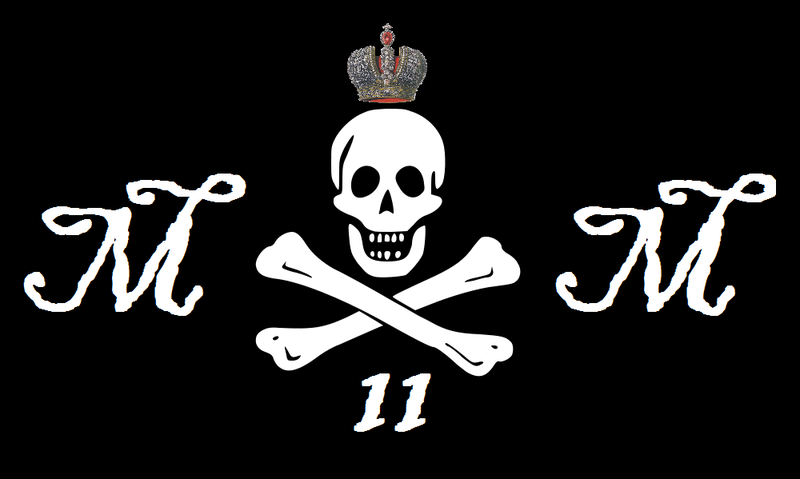 And, as always, my thanks to everyone for reading and keeping up with The Mad Monarchist in 2012. I hope you have found it of some benefit and I hope you will all be back next year, though it may be a slow start this time. I appreciate your reading, and your patience and hope you all have a happy new year and the best of 2013. 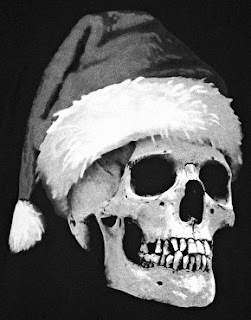 Okay, the "holy" day of commercialism is almost here, I’m being hounded there and back, people are invading my home, it’s cold and I’m cranky so this is going to be a quick one. Starting in the Far East, His Imperial Highness Crown Prince Naruhito of Japan attended the premiere of “Les Miserables”, HM the King of Bhutan addressed his people on National Day, congratulating everyone on achieving democracy (yeah, hooray for that) but also reminding everyone that democracy is not “the” point and an end in itself. Over in the Middle East the Emir of Kuwait warned protesters that constructive criticism is fine but that lawlessness and disorder will be suppressed (amen) at the opening of a new parliament on Sunday. King Hamad of Bahrain stressed the need for tolerance at the opening of a new education fund for special needs students, the Emir of Qatar went on a walkabout to meet his subjects on National Day and the super rich shook their heads in envy at word that a Saudi prince is about to buy a $500 million private plane. In Europe, Crown Princess Mette-Marit of Norway was honored for her charity work at a gala in Berlin, Germany for the “A Kind Heart for Children” campaign. HM King Carl XVI Gustaf of Sweden held a special dinner for the Nobel Laureates, Prince Carl Philip picked up some Christmas trees and visited the Federation of Swedish Farmers. The Spanish Royal Family got their Christmas cards sent out (mine has not arrived yet) and in Britain the Duchess of Cambridge is said to be recovering from her recent ill-health and the Duchess of York opened a new cancer center for teens in Cambridge. HM the Queen (to her credit) became the first British monarch since Queen Victoria to sit in on a cabinet meeting, which she did on Tuesday. HRH the Princess Royal paid a morale-boosting visit to British troops in Afghanistan, visiting the army base at Camp Bastion, the Prince of Wales and Duchess of Cornwall helped pass out Christmas goodies and Princess Eugenie helped cheer up patients at the Royal National Orthopedic Hospital in Stanmore. And, finally, on what can only be described as a humorous note, the government of Argentina has filed a formal protest with the UK ambassador over the British government naming the British Antarctica claim “Queen Elizabeth Land” in honor of Her Majesty’s Diamond Jubilee. Yawn. Leave it to a republican government to get prissy about the name of a (largely theoretical) British claim to chunk of uninhabitable ice being given a new name as a way to honor a long-serving monarch. The Argentine senate unanimously passed the bill expressing their opposition to the name-change along with cries of “imperialism” because, of course, as the Union Jack is even being hauled down in Belfast and Wales and Scotland each have their own governments, “imperialism” is just the word that comes to mind when one thinks of the modern United Kingdom. What is next, a protest to the UN? Will their be a conflicting territorial claim? Yes, that hunk of ice belongs to Argentina whether the penguins want to be British or not! Still, I envy Argentina that things must be going so well down there that their government has no more pressing business to attend to than this. Among the Mayan city-state kingdoms, one of the most powerful was the “Snake Kingdom” or Kaan ruled from Calakmul. The ancient city sits in what is now the Mexican state of Campeche. 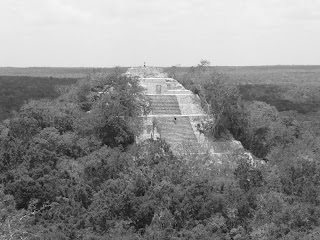 During the early classic period of the Maya, Calakmul rose to become a major player, effectively a regional super-power and one of the monarchs who presided over that era of success was King Sky Witness, about whom next to nothing was known until fairly recently. Modern scholars have determined that he must have come to power at some point before 561 AD as it was in that year that Sky Witnesses set up a ruler, effectively a viceroy, at Los Alacranes or, as it was known then, the region of B’uuk’. This was probably the first of the conquests of the Mayan armies of King Sky Witness but certainly not the last or the greatest. The next to fall was Caracol, south of Naranjo in what is now Guatemala, the seat of the Saal kingdom. This brought Calakmul into direct conflict with their most powerful neighbor to the south; the city-state kingdom of Tikal (also known as Mutal). Caracol had been effectively a vassal state of the Tikal kingdom and when King Sky Witness brought it into the sphere of influence of Calakmul it demonstrated the start of a long and bitter rivalry between Calakmul and Tikal; a clash of two regional superpowers for control over weaker Mayan populations surrounding them. In the past, Tikal may have been the stronger, dominating most of the southern Yucatan Peninsula, but the “Snake Kingdom” of Calakmul was on the ascendant, had been before the accession of King Sky Witness and would remain so for some time. The conquests of King Sky Witness brought about open warfare between the “cold war” rivals and with Tikal power on the decline, it did not take long for King Sky Witness to assert his supremacy when, in 562, his Kaan warriors won a decisive victory over the forces of Tikal. Information on this is extremely scarce and is gleamed mostly from unearthed hieroglyphics found at Caracol. 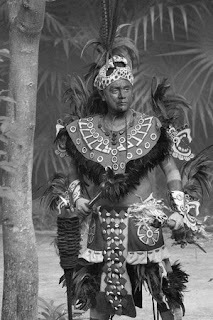 However, it seems that the victory was total and that King Sky Witness had Wak Chan K’awiil (King Double Bird), the King of Tikal, taken prisoner and then sacrificed to the gods of Calakmul. 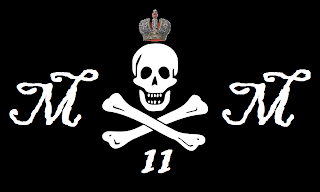 It also seems likely that the rest of the royal family was massacred as the next Tikal ruler for whom evidence can be found, King Animal Skull, came from a completely different lineage than the previous monarchs. So total was the victory of King Sky Witness that there no evidence has been found of any monument records for Tikal for the next 130 years. Evidently, this earned King Sky Witness quite a legendary reputation as his name is recorded far to the north in Okop (in what is now the Mexican state of Quintana Roo) as the “enemy” in an attack on western Palenque in 599 (Palenque being the future seat of power of the famous King Pacal the Great). Why is that so astonishing? Mostly because King Sky Witness was almost certainly long dead by that time, yet his legend was evidently great enough that crushing victories were still being attributed to him. 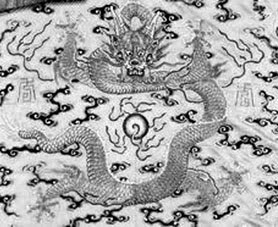 The last reference to King Sky Witness has been found, again, at Caracol and is dated to 572 which some scholars believe may have been the year of his death as there is evidence that by the following year the “Snake Kingdom” had a new ruler in the person of King First Axewielder. King Seonjo was the fourteenth King of Joseon in Korea. He was born Prince Yi Yeon in Seoul, the third son of the “Great Prince of the Court” Deokheung Daewongun on December 26, 1552. With the title of Prince Haseong he was chosen by the royal court to succeed the young King Myeongjong who died without an heir. King Seonjo was then only sixteen years old when he succeeded to the throne in 1567 as the ruler of Korea. Early on, his reign showed great promise but he would ultimately have to face one of the greatest tests of any Korean monarch. King Seonjo showed genuine concern for the welfare of his people, was committed to reforming the government and establishing Korea as a vibrant and powerful kingdom. He sponsored the revival of a group of scholars who had previously been persecuted and appointed many new scholar-officials to high office in an effort to replace those who had grown corrupt with a new generation. One of his most important acts was to reform the Confucian civil service examination, broadening it to include a wider range of subjects to make for more knowledgeable and well-rounded officials. King Seonjo himself intervened to make sure that candidates had an extensive knowledge of history and political science as well as the Confucian literary classics. This devotion to education and scholarship, based on Confucian morality but encompassing a variety of subjects was something that royal Korea remains famous for. 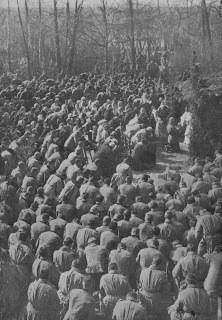 The efforts to get rid of bad officials and promote more honest and competent men made King Seonjo quite popular with his people and as a general trend, this devotion to learning helped make Korea a much more advanced country than most would expect, at times surpassing more powerful neighbors like China and Japan in certain areas. By his actions, King Seonjo raised the level of talent amongst the scholar officials which, in turn, made life better for the common people. With living conditions improving and the country at peace, the people prospered and admired their monarch. Unfortunately, divisions began to arise in the kingdom in the persons of two high officials; Sim Ui-gyeom and Kim Hyowon. Sim was the conservative of the two and Kim the liberal and each gathered their own factions of supporters. 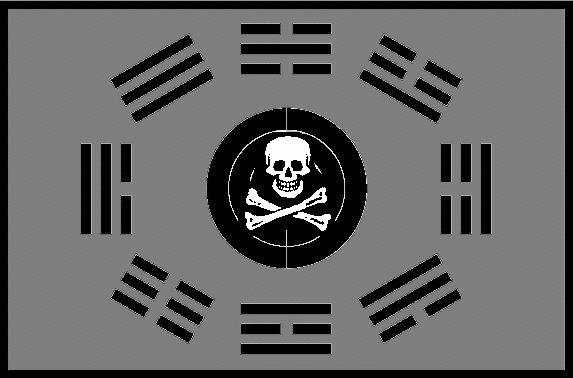 Since those supporting Sim lived on the west side of Seoul and those of Kim on the east side, they became known as the eastern and western factions. King Seonjo himself struggled over favoring one side or the other. It was the beginning of a long-running feud that would eventually prove disastrous for the country. Early on, King Seonjo supported the conservative, western faction of Sim who was related to the Queen and had many supporters amongst the aristocracy. However, their slowness to embrace or even opposition to some of the reforms favored by the King gave Kim and the eastern faction a chance to rise to the top and the King moved to their side. This made enacting the reforms easier but, after a period in power, they began to have second thoughts and soon split into two sub-factions. Matters were further complicated when one of those sub-factions split into two even more radical factions of their own. Obviously, this was devastating for the smooth operation of government and became a major source of weakness for Korea. Faced by the rising powers of Japan and Manchuria, conservatives advised a stronger army but the liberals absolutely rejected this. Like many idealists throughout history, they thought the era of peace would last forever. They were very much mistaken as both Manchuria and Japan were vibrant and expanding powers and this put Korea at a great disadvantage when the Manchurians moved into China, eventually establishing the Great Qing Empire, and Japanese forces began to return to Korea. Many have since criticized King Seonjo for his handling of this crisis but he was really faced with an impossible situation. The Manchu forces to the north, especially over time, would have seemed the greater and more immediate threat and so he focused most of his resources there. However, the Japanese forces made up for in talent what they lacked in numbers in the south. With commanders like Tokugawa Ieyasu, Oda Nobunaga and Toyotomi Hideyoshi, they were bringing their “A” game, while the best Korean commanders were deployed on the opposite end of the peninsula. King Seonjo had to take a chance and he happened to choose incorrectly. 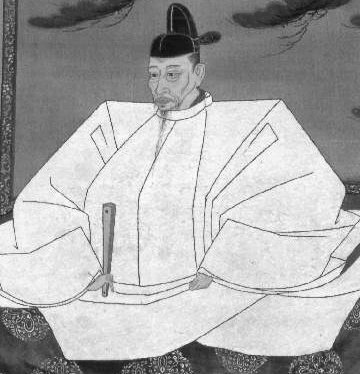 The southern threat was the more serious with a major offensive by Japanese forces led by Hideyoshi Toyotomi, known to later westerners as the “Napoleon of Japan”. King Seonjo was also crippled by the factionalism at court. Those who supported concentrating on the northern front downplayed the Japanese threat while their political enemies did the same regarding the Manchurians. Fortunately for the King, whether he knew it or not, he had a winning commander in the naval genius Admiral Yi Sun-sin; known by later generations as the “Nelson of Korea” to confront the “Japanese Napoleon”. However, it was a long and painful process. Following the Japanese invasion of the south there were a string of victories for Japan. 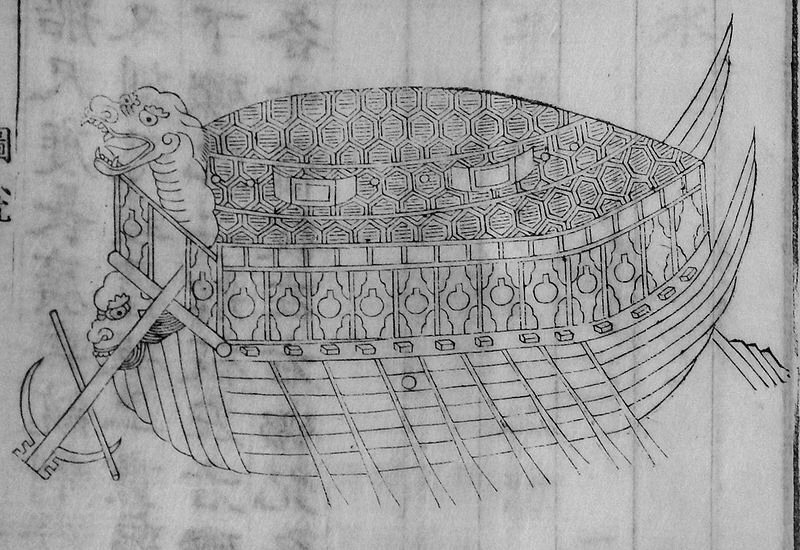 King Seonjo tried several commanders who were each defeated as the Japanese pushed north, taking Seoul and Pyongyang where the King and court had relocated to when Seoul became imperiled. Between the Korean withdrawal and the arrival of the Japanese much of Seoul, including the palace, was looted and a great deal was lost. 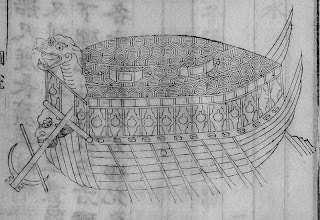 However, the tide began to turn as Admiral Yi Sun-sin devastated the Japanese supply lines, making use of his brilliantly innovative “Turtle Ships” which were forerunners of the armored warships with diverse weaponry of later centuries. Finally, after a stunning victory for Korea at the battle of Hangju the Japanese agreed to talk peace. One of the famous, formidable "Turtle Ships"
Korean troops re-took Seoul, allowing the King to return and although, after a brief respite, the Japanese returned, the death of their commander brought peace and breathing room for Korea. Yet, King Seonjo did not enjoy the surge in popularity one might expect for a victorious monarch. The country had been devastated by the war, the people were hungry and discontented and, most damaging of all, the political factionalism stubbornly remained and hampered the well-meaning efforts of the King to rebuild his country. Frustrated and demoralized, King Seonjo finally abdicated in all but name and turned most of his official duties over to the Crown Prince. He died in 1608 with Korea still in the grip of a painfully slow recovery, politically divided and caught between two powerful neighbors. Because of all of this, King Seonjo does not tend to be well remembered. However, the worst disasters to befall Korea during his reign were not his fault and would have been beyond the control of any. He tried his best to improve the lives of his people and the structure of government as well as better training for the military. He is often blamed for having gambled and lost in viewing China as the greater threat only to see Japan conquer almost the whole country. However, in fairness, if he had concentrated everything in the south, it may have been simply a different enemy that did the same and, as it was, Korea still came heavily under Chinese influence. There was plenty of will and plenty of talent so that Korea could have remained more totally independent, but with the leaders of government so bitterly divided, even in the face of great external threats, a benefit for either China or Japan was inevitable. King Seonjo did his best under the most difficult of circumstances and he should be remembered for this. Anytime the good name of brave soldiers who fought, endured and sacrificed is insulted or belittled is a tragedy. 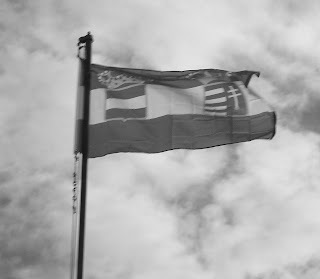 One group that has continually been overlooked, downplayed and underappreciated is the armed forces of the Dual-Empire of Austria-Hungary during the First World War. Some regrettable mistakes and setbacks have, over the years, been so often repeated by lazy historians that they have been overblown and exaggerated out of all proportion so that the military contribution of Austria-Hungary is completely misunderstood. 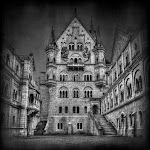 This injustice is all the more severe in regards of the soldiers of the Hapsburg realm because, unlike other similar cases, there was no country after the war to defend their reputation. After the defeat of the First World War, Germany, Bulgaria and Turkey remained at least on the map but “Austria-Hungary” had been completely erased. Even for some of the highest ranking officers, the end of the war sometimes left such men without a country. This had made it all too easy for post-war historians to denigrate the accomplishments of the Austro-Hungarian armed forces without being challenged. When one considers the tremendous and unique difficulties the soldiers of Austria-Hungary faced, it is nothing short of remarkable that they did so comparatively well. When war broke out in 1914, the armed forces of Austria-Hungary certainly seemed formidable on paper. With reserves fully mobilized, the Imperial-Royal Army was one of the largest in the world, they looked very smart on parade, had generals of high reputation and some of their weapons (particularly the artillery) were rated as some of the best in the world. Yet, as most know, the simple numbers could be deceiving and Austria-Hungary faced a great many military handicaps. Most of the soldiers lacked experience and they did come from a dizzying array of ethnic backgrounds that caused a linguistic and organizational nightmare. It was a problem, however, despite the impression many have, there were no catastrophic lapses in discipline. This is an important point considering that the nationality problem is often exaggerated to the point that many think the bulk of the Imperial-Royal Army was made up of sullen captives, yet the Hapsburg armed forces experienced nothing like the mutinies that swept the French army which had no such ethnic difficulties to deal with. Despite the best efforts of Count Conrad von Hoetzendorf to modernize the army, it still lacked behind other armies but did have superb artillery and certain groups, such as the Austrian light infantry and Hungarian cavalry were world class. Those who scoff at the Imperial-Royal military also often pay scant notice to the great number of fronts Austria-Hungary had to manage. At one point there was the Serbian front, the Italian front, the Russian front and the Romanian front to deal with and there were also Austro-Hungarian contingents fighting on the western front and in Palestine before it was all over. This factor alone would have been enough to test the strength and organizational capacity of even the most advanced and homogeneous powers. Additionally, despite what some think, the diversity of Austria-Hungary was not, in every case, a weakness. 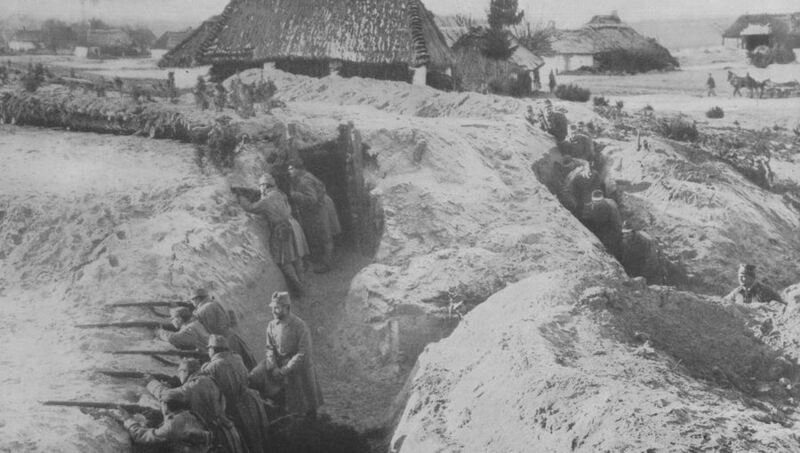 Polish forces, for example, rallied to the promise of the liberation of their homeland and Bosnian Muslim forces made up the bulk of the Hapsburg forces sent to the Middle East to support the Ottoman Turks. Of course, the religious diversity is not often remarked upon either. Most of the leadership were Catholics but the rank and file were Catholic, Protestant, Orthodox, Muslim and Jewish and there were never any major problems because of that. It is still a bit controversial today, but there is also the point that Russia had a highly placed spy in the Austro-Hungarian army and so much of the planning for the war was already known in St Petersburg when the fighting started. Given that, the fact that the Imperial-Royal forces won any battles at all is rather remarkable. As to the war itself, it is often forgotten that the initial engagements on the Russian front were Austro-Hungarian victories. The same could not be said of Serbia but then, of course, the bulk of the military force of the empire had to be shifted away from Serbia to meet the greater danger of Russia and so it was a greatly reduced force that advanced into Serbia where the locals had the advantages of fighting a defensive war with the terrain to their advantage and they were also simply a very tough and determined foe. 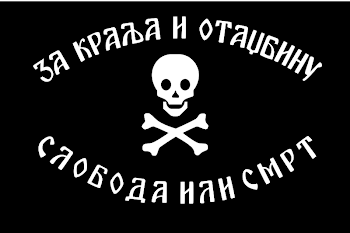 Yet, while much is usually made of the Imperial-Royal forces having to retreat from Serbia, many fail to mention that the Serbs were themselves defeated before Sarajevo and driven back behind their own borders. Likewise, on the Russian front, while there were costly setbacks following initial gains, Austria-Hungary did finally push the Russians back into their country as well. The war did not begin well, certainly, with heavy losses that included many of the best and brightest for little to no gain. However, the empire had been successfully defended from counter-attacks and gains would be made in the future. 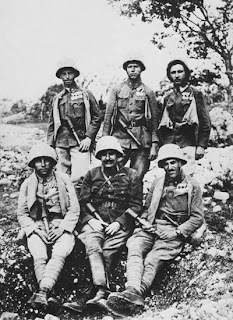 In 1915 a renewed offensive saw Serbia successfully conquered and after Italy joined the war the Austro-Hungarian forces held their own against superior numbers, giving ground grudgingly and taken a heavy toll on the Italian armies. 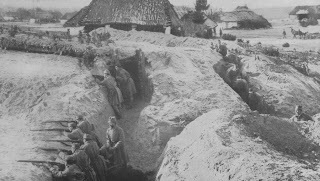 1915 also saw the Gorlice-Tarnow Offensive which resulted in a stunning defeat for the Russian forces and yet, all too often, the Austro-Hungarian contribution to this success is often ignored. The same could be said for many other victories won when German and Austro-Hungarian forces were working together, such as in the Balkans, Romania and the big victory in Italy at Caporetto. However, important though the German assistance undeniably was, the Germans did not win all these victories all on their own and the Austro-Hungarian forces deserve just as much of the credit for the part they played in all of them, many times shouldering most of the burden. It is also worth pointing out the other armed services of Austria-Hungary which likewise seldom get the attention or credit that they justly deserve. On the naval front, for example, there may not have been any big clash of fleets in the Adriatic but the Imperial-Royal Navy was successful just as a threat in keeping enemy forces at a distance. 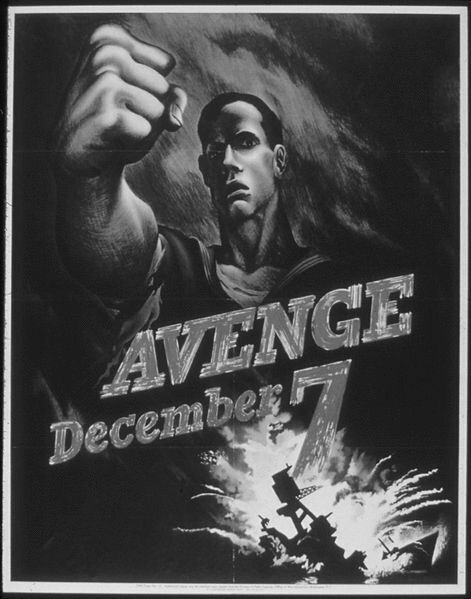 They also carried out several very damaging raids on Allied naval forces. Few also realize that the tiny Austrian submarine force actually had a greater percentage of hits per torpedoes fired than their German allies did. In the air, despite having a rather late start and being often outmatched, the Austro-Hungarian air forces had quite an impressive record with no less than 20 flying “aces” with some shooting down more than 30 Allied aircraft. Things began to go dangerously wrong in 1916 but even then it was often a problem of logistics and a lack of the basic necessities (due to the Allied blockades) rather than any lack of courage or failure in strategy on the part of the Imperial-Royal military. The South Tyrol Offensive against Italy, for example, ended in failure in large part because supplies were exhausted. In 1917 there was, with German support, the victory over the Italians at Caporetto, however, the privation that Austria-Hungary was suffering from as a whole at that time was still felt. The commandeering of supplies for the offensive meant that large parts of the empire starved and still supplies running out for the fighting men also played a part in that offensive coming to a halt. The winter of 1917/1918 saw strikes and bread riots become a major problem in Austria-Hungary for the first time since the war began. In the years prior, the people had endured a great deal and tremendous losses with stoic determination. Yet, every people has their breaking point and 1918 saw it reached in the lands under the double-eagle. Germany, of course, eventually went through much the same. The last, bungled, offensive planned against Italy was to have been a complex and brilliant maximum effort with army-navy coordination but it began to unravel when the starting date had to be delayed because the troops simply lacked the physical strength, due to malnutrition, to carry it off and the whole thing fell apart. Still, even in those last years of the war, despite immense problems, professionalism was still on display. The Emperor Charles (Kaiser Karl) took personal control of the army and continued with a reorganization already planned by Count Conrad von Hoetzendorf. Austro-Hungarian units also developed their own storm troops and their mountain specialists likewise gained an elite status for themselves and rightly so. These units, and the army as a whole, were also quite cohesive and, again, only saw widespread disobedience at the very end of the war when Austria-Hungary was coming apart. Even then, the troops behaved, by and large, in an orderly fashion, following the instructions of their newly proclaimed governments to stop fighting, put down their weapons and go home. Given the odds against them and the immense difficulties they faced, what the soldiers, sailors and airmen of Austria-Hungary accomplished is really quite remarkable and in a one-on-one scenario, any of their enemies would have found them a formidable foe. Which is also worth keeping in mind; the original plan of Austria-Hungary had always been to fight a war limited to the Balkans and had that been the case there is every reason to believe they would have been victorious. Anyway, enough with the babbling. This is a tragedy, a horror, a nightmare and the grief of others is not something I find it easy to deal with. I will try to stick to some simple, basic points that seem to come up on such occasions. First, I will deal with an easy issue. Anytime something like this happens you can count down the seconds until someone brings up gun control. That is, in a word, “stupid”. Some countries have even more widespread gun ownership than America and they have less shootings (like Switzerland) while other countries have totally banned all guns and seen gun crime increase (like the UK) because -shock of shocks- lawbreakers tend not to care about the law. Recently there was another shooting in which the shooter was using a stolen firearm. Gee, if only we had thought to pass a law against stealing! Oh, wait… Now, I am not trying to diminish the pain of someone being shot. By no means. I have been shot, I know exactly what it feels like to have a hole blown through your body so I don’t want to hear any smart remarks about me being ignorant of what a gun can do. I do. Furthermore, I don’t think you need to experience that to know that it is not pleasant or that some things are worse. Given the choice of being shot or stabbed, I have never known anyone who picked “stabbed”. Anyone who would do something like this will find a way to make it happen, if he has to steal a gun, buy one on the black market or use some more creative means of taking the lives of others. That whole issue is simple for me. The only thing I really don’t understand is why so many of these types kill themselves afterward. Why not just off yourself in the first place and save a whole lot of time and aggravation? It reminds me of a line from a poem that someone (let’s say a doctor) told me once and has stuck in my head ever since, “Good creatures, do you love your lives / and have you ears for sense? / Here is a knife like other knives, / that cost me eighteen pence. 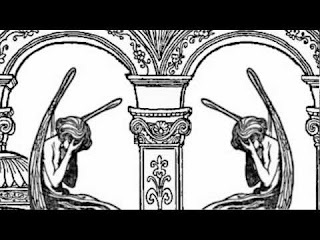 / I need but stick it in my heart / and down will come the sky, / and earth’s foundations will depart / and all you folk will die.” It is nearly impossible to stop someone who is bent on destroying themselves and almost as difficult to stop those intent on harming others. There is only so much that “we” can do but, as the increasing number of these tragedies shows, I think it is obvious we could do more. In the aftermath, everyone wonders “why” and “how” such things could happen. I am no more an oracle than anyone else, but one thing does come to mind. Perhaps it is the sort of thing one can only come up with if one has a first-hand grasp of mental disorders. In a word: empathy. Everyone, I don’t care who you are, at times has violent thoughts. And I don’t think it matters what music you listen to, what movies you watch or what video games you play. Why I ask myself how someone could do such a thing, all I can come up with is that we are, as a people, becoming increasingly incapable of truly understanding the pain of others at all. Is it because our society as a whole is becoming ever more impersonal? Is it because things like charity, kindness and compassion are increasingly becoming a duty of the government rather than an individual responsibility? I don’t know, it may all play a part in the larger trend but I am fairly certain that no one could do what this person did if they had even the slightest capacity to understand the pain felt by others. We are becoming more self-absorbed while at the same time less and less officially “selfish”. But that cannot be the only problem. The problem, I think, is bigger but still simple, and that is God. 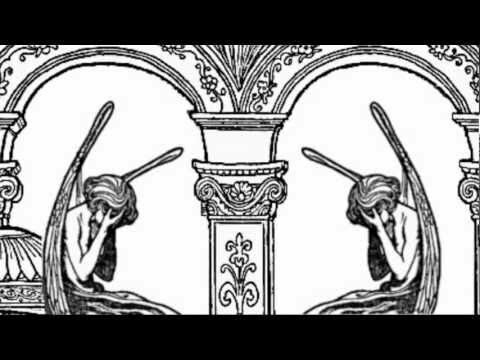 When you see the horror, the pure evil that was done, such actions (to my mind at least, and I know people will call it backward and superstitious) can only be attributed to the Devil. We have become an increasingly godless society and one in which we do not even agree on the most basic difference between “right” and “wrong”. In fact, it seems we are increasingly convinced that such distinctions do not even exist. Obviously, I am not saying that this would not have happened if the murderer had gone to Church or anything like that, but it is just as obvious that this was someone who did not fear divine judgment or have any respect for the law of God, including “Thou shalt not kill”. But, it is bigger than that. I know many people will be upset that I go back to this issue, but I cannot help it, the fact is that we in the United States, legal, law-abiding citizens, have murdered 50 million babies since 1973 and each one of those lives was just as precious and just as innocent as the children murdered in Connecticut. The only difference seems to be that if you kill your own children soon enough we have no problem with it but a dead child is a dead child and by condoning one while condemning the other, it seems to me, is sending an extremely mixed message about the value we place on human life. Our prayers and condolences go out to the victims of this atrocity. Words cannot express the heartache. My parents know what it is like to bury a child (three in our family) and that is a pain that never goes away and that no one should ever have to experience. All I can do is pray for them and take some comfort in the fact that I know, in my heart, these children are with the angels and the one who took their lives is in torment and will be forever. It is a great tragedy and further proof, to me at least, that we need God. As the Good Book says, quite simply, “God is love”. We need to stop turning our backs on it and embrace it, the only alternative is suffering. A wise king scatters the wicked, and bringeth the wheel over them. Starting in the British Isles, HRH the Duke of Cambridge has taken some time off to be with his wife who is still struggling with bouts severe morning sickness. It was also announced this week that this year HM the Queen will make a little history by broadcasting her annual Christmas speech in 3D. The message was recorded last Friday at Buckingham Palace. HRH the Duke of York was on hand to welcome British troops coming home from the front, HRH the Prince of Wales said that HM King George III is the monarch he respects most (excellent choice) and the bill to change the succession law has been formally introduced (boo!) to show that while gender discrimination is bad, age is discrimination is perfectly acceptable. Why can so few see the total absurdity of this whole line of thinking? Anyway, moving across the North Sea to Scandinavia, Prince Daniel attended a diversity seminar (how lovely) and Princess Madeleine visited a special Christmas lunch by the Swedish-American community. The royal families of Sweden and Norway were also on hand for the Nobel Prize ceremony, as usual. Anyway, Princess Charlene is not the only royal fond of sport. HH the Emir of Qatar, speaking at the Doha Goals Forum, said that “Sport has the ability to transcend cultural and ideological barriers and forms of disparity,”. A noble sentiment, but I have a hard time agreeing with that considering how being politically correct seems more important than physical ability in so many cases involving sports these days. There was relief across the border in Saudi Arabia when, on Thursday, HM King Abdullah (age 89) returned from the hospital four weeks after undergoing back surgery. Oil markets are always nervous about the health of the King of Saudi Arabia and there is more to be concerned with lately considering that some of the reforms the King has enacted recently have not been well received in some quarters. In the North African Kingdom of Morocco, an AFP journalist had their accreditation revoked after the reporter wrote that the “Authenticity and Modernity Party” was “close to the palace”. The Prime Minister said this was unacceptable, that the King is totally apart from politics and that no one would be tolerated who tried to connect the King to a particular party. The AFP is pouting about it. Finally, in the Far East, HIH Crown Princess Masako of Japan celebrated her 49th birthday last Sunday. On that occasion Her Imperial Highness also said that with help from her doctors and the people she is continuing her efforts to recover from the stress-induced illness she has been dealing with for most of the last decade and which has kept her largely out of the public eye. In a statement released by the Imperial Household Agency (shudder in fear!!) the Crown Princess said, “As the treatment has lasted for a long time, I suppose that I have caused so much worry,” which I thought was very touching. She continued saying, “I would like to take this opportunity to express my heartfelt gratitude to all the people in the country for their continuous warm support”. She spoke with pride about the accomplishments of her daughter and expressed her solidarity with the earthquake and tsunami victims. The Grand Master of the Crown Princely household said that the Crown Princess is steadily recovering, is taking a small amount of medication and sees doctors as needed. Recently, the eyes of the world have again been drawn to the Far East thanks to the antics of the Orwellian real-life nightmare that is North Korea. Such incidents make me think and that is usually not a good thing, at least not for any poor soul who happens to come see me in the aftermath and is subject to a long, manic lecture on my obsession of the moment. Well, you happened into this corner of the inter-webs so you get it too. When I look at Korea, I am reminded of a few things. For one, I am reminded of why I could never condemn all American intervention overseas. True, I look back on American military history and see no vital reason for most of the wars America has fought, but when I look at South Korea as compared to North Korea, I say, “well done America, Great Britain and all the other allies”. Too bad the whole peninsula could not be as prosperous as the south. It also makes me angry again at the U.S. government (or the Democratic Congress anyway) for the abandonment of South Vietnam, which could be just as successful today. However, after such a pat on the back, I also think about what an obvious nightmare it is that countries like Korea, China and the Indochinese lands broke from their own long established traditions to embrace the political feuds of the western world. I think of the fallen dynasties and the whole populations nearly brought to ruin in wars driven by competing allegiances to totally alien ideologies, being used as proxies usually for the United States or Soviet Union. Not that those two were in any way comparable, as the contrast between North and South Korea clearly shows, but it is a crying shame it ever came to that in the first place. Now, usually, when I go on this tirade, someone will mention that it was from the west in general or the United States in particular that people learned about things like freedom, liberty or the great “gift” of democracy. Please, spare me the sanctimony. There were certainly things the east needed to learn from the west but there were also plenty of things the west could have benefited from learning from the east. On a moral level, each seem fairly well matched to me. The most basic traditional values of right and wrong were much the same in both parts of the world, and both have abandoned many or most of these in our time anyway. However, it positively infuriates me that so many people seem to think that before the era of republicanism all the peoples of the east were living in grinding poverty and near slavery. That, in a word, is idiotic. You could say the same thing about the west. How everyone seems to think that before the era of the so-called “Enlightenment” and especially before the revolutionary era, everyone lived in oppression and ignorance. They forget all about the great universities established in the Middle Ages, the tremendous scientific, literary and artistic discoveries of the Renaissance or how, even in feudal times, most Europeans had more holidays from work and paid less to their governments than they do today. But in the east this same ignorant attitude has often also been combined with a disgusting dose of condescension and thinly veiled racism. I will never forget finding an old school book, written sometime in the 1910’s, that spoke with such arrogant, ignorant pride about the 1911 Revolution in China. This was from a contemporary American perspective of course, and the book spoke so smugly about how the Chinese had finally “grown up” and were embracing the idea of the republic which, of course, Americans were “smart” enough to have figures out two centuries earlier. One would think the very concept of “freedom” had only been invented in Philadelphia in 1776! This is obviously garbage for anyone with even a passing familiarity with the facts. Under the Confucian monarchy, for example, Korea actually had a more meritocratic system hundreds of years ago than the United States has even today where your popularity can get you a high position even if your ability is nil. The imperial system in China certainly could not have survived for thousands of years and maintained a vast country with the largest population in the world without doing something right and the masses would not have just submitted for so many centuries if they were all living like slaves. The Mongol Empire, for example, had freedom of religion, vibrant commerce and laws protecting property and all without a written constitution or elected national assembly. Tell that to a republican today and blow their mind. Human beings the world over had plenty of time to learn what worked and what did not and, unlike today without our collective safety nets, if something didn’t work the consequences could not be ignored. People learned from it, adapted and moved on. When a system was found that worked, they stuck with it until it became sacred tradition. Many attributed foreign influences with the establishment of the Japanese constitutional monarchy in the Meiji Constitution. However, it embodied the same values held by the Japanese going back at least to the Seventeen-Article Constitution released in 604 by Prince Shotoku. This document included such points as being tolerant of disagreement, not to be envious, not to conscript people at times that would prevent them from providing for themselves and that important decisions should be left to one ruler but taken after discussion. Those who believe that government which governs best is that which governs the least might also be surprised to learn that many Chinese came to the same conclusion a thousand years ago. In Imperial China there was the famous saying, implying considerable freedom through benign neglect that, “Heaven is high, and the Emperor is far away”. Today we smart, modern people in our republican world think that we have to have a small army of politicians at every level of government and all of these people always think they have to be “doing something”. Are these hordes of compulsive regulators really creating more freedom as compared to the traditional systems of the past where the Emperor of Japan just prayed for his people or where the Emperor of China was “far away” in Peking? In Imperial Vietnam there was a very old traditional saying that the authority of the Emperor stopped at the village gate. This was, obviously, not absolutely the case but it arose because of the considerable autonomy that existed from village to village. The Emperor in Hue or (prior to that) Thanh Long focused on the big issues while for the most part the people were governed on the local level by their own village elders with an occasional visit from an itinerate mandarin. They also had sense enough to appreciate the importance of saving for a rainy day whereas today we seem to have made a “virtue” out of not saving anything and even spending money we don’t have. Remind me again; who are the ignorant ones? Those people ruled by kings and emperors who actually produced things or the populations of today who have every minute detail of their lives regulated and have based whole economies on betting on the profit or loss of products that no one has even made yet? They had a government with one emperor and an economy based on real money and real goods. We have governments made up of thousands of parasites and economies based on moving around “potential” (imaginary) money no one has even earned yet. People in the past, as I am so fond of saying, were not stupid and the Vietnamese who used to watch tigers and elephants fight in an arena were a hundred times more civilized than the people who watch “The Jersey Shore”. People in the East, as well as the West, were not living a nightmarish existence before the revolutionary republic was introduced and I have no doubt that all would be better off to return to tried and tested traditional ways, adapted for the modern world and technological improvements, while throwing away modernistic concepts that have so clearly and painfully failed. 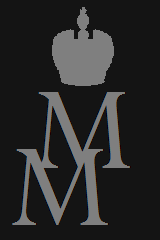 I think such a thing would be beautiful, but then I am, as any will say, just … The Mad Monarchist. Wilhelm I, the second King of Wurttemberg, was born on Lueben on September 27, 1781 to King Friedrich I and Queen Augusta von Brunswick-Wolfenbuettel. He was born into a family in a less than ideal situation. 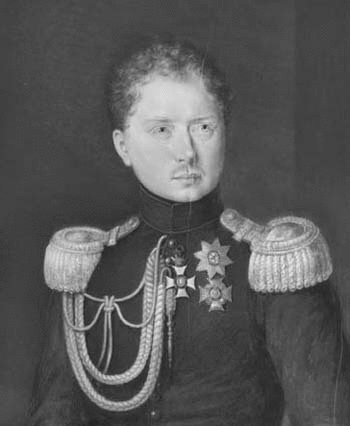 His father had been frustrated in his military career in the Prussian army and was later made Governor of Finland after his sister married Tsar Paul I of Russia. 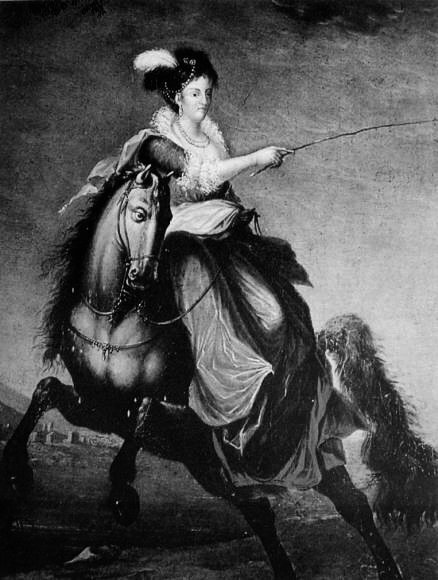 Marital discord continued and finally Catherine the Great dismissed Friedrich and he sent his sons, including Friedrich Wilhelm (known as Fritz throughout his life before coming to the throne) were sent to live with friends in Wurttemberg where their father wanted them raised and to be the country they most identified with. Little Fritz had a very strict upbringing and as he grew older he was often at odds with his father. Things became so bad that in 1799 Fritz planned to run away but was discovered and his father had him arrested. But, he was later released and attended university before war came to Wurttemberg with the arrival of the French in 1800. 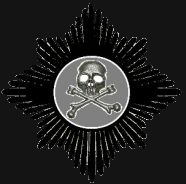 Fritz volunteered for the Austrian army and over the course of his military career so distinguished himself that he rose to the rank of major general in the Austrian (Holy Roman Empire) army. He fought in the battle of Hohenlinden and was cited by numerous sources for his skill and courage. However, in the aftermath, along with sowing some wild oats, he championed the foreign policy views of the aristocracy which did not always coincide with those of his father and Fritz finally left the country, traveling around Europe. He went to Paris, Vienna and Saarburg before being employed in an official capacity to represent his father in France. He had an audience with Napoleon and helped to arrange a settlement between the French Empire and Wurttemberg, which eventually rose to the status of a kingdom with his father as the first King of Wurttemberg. 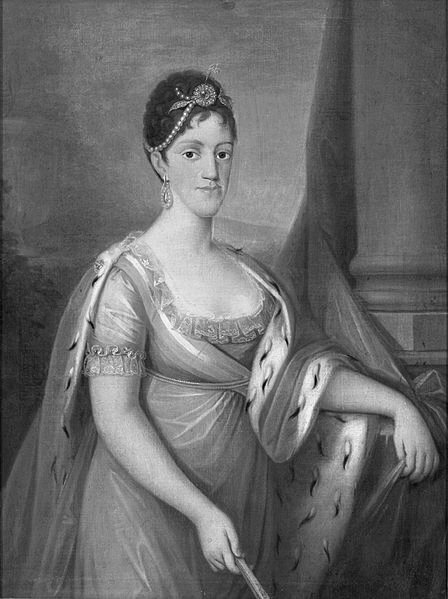 In the process, his father was able to break Fritz away from his current love interest and in 1808 he married Princess Charlotte of Bavaria in Munich; the daughter of King Maximilian I. With Britain gathering Russia and Austria as allies against Napoleon, Baden and Bavaria joined in a counter-alliance with France which Wurttemberg was finally compelled to join as well. If Friedrich were to prove uncooperative, the able Machiavellian Prince Talleyrand had planned a coup to topple the Elector and replace him with Fritz. However, despite their problems, Friedrich Wilhelm would have nothing to do with any scheme to remove his father from the throne and his cordiality toward France cooled considerably after this. Still, he was given little real responsibility in the government of Wurttemberg and instead took the time to broaden his knowledge, undertaking a study of agriculture. In fact, it was after a royal marriage was sought with the House of Wurttemberg to strengthen the French-created Kingdom of Westphalia that Fritz got his father to agree to his own marriage to the Princess of Bavaria. 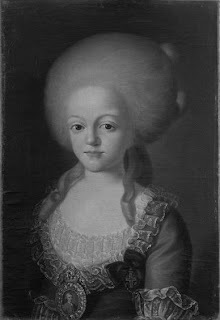 However, it was a political match and there was no real romance between the two at all and Princess Charlotte found herself to be quite a lonely figure as Crown Princess of Wurttemberg. 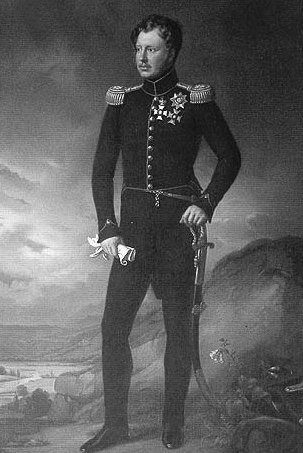 The Crown Prince lived mostly apart from his wife and when war broke out again he led the Wurttemberg contingent in the French campaign against Austria, securing the eastern frontiers of the new kingdom. Likewise, he commanded the Wurttemberg army in Napoleon’s massive campaign into Russia. The troops fought heroically but suffered terrible losses with only a few hundred surviving out of a corps that originally numbered nearly 16,000. Fritz might have been among them had not an attack of dysentery forced him to leave the front, a fact with aroused the suspicions of Napoleon. Still, in spite of these horrors, Wurttemberg rebuilt her battered army and continued on until after the decisive battle of Leipzig after which Wurttemberg broke the alliance with France and joined the coalition against Napoleon with Fritz taking command of the army again with Austrian reinforcements. He led his forces in the final campaign of 1814, alongside the King of Prussia and Tsar of Russia, that eventually saw Paris taken and Napoleon forced to abdicate and go into exile. 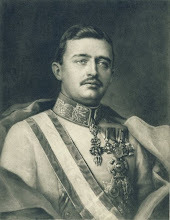 With the political situation changed, Fritz saw no reason to carry on with his “show” marriage to Princess Charlotte and sought a divorce on the grounds that the marriage had never been consummated. 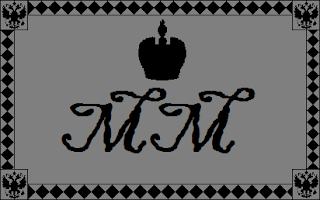 King Maximilian agreed and King Friedrich I made it official, though as Princess Charlotte was Catholic she had to await a ruling from the Pope on the matter. Happily, this came through and she went on to marry no less a figure than Emperor Francis I of Austria. Fritz had said from the very beginning that they were both “victims of politics”. 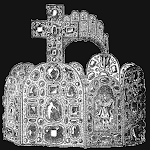 This left the Prince free to marry Grand Duchess Catherine Pavlovna of Russia in St Petersburg in 1816 by whom he had two daughters (the younger of whom later married King Willem III of The Netherlands). He had fallen in love with the Grand Duchess while visiting family in England and it was at least a happier marriage than his first. Both attended the Congress of Vienna and when Napoleon returned to France for one last roll of the dice, Prince Friedrich Wilhelm took to the field again but was not present for the last climactic battle with Imperial France. In 1816 things happened quickly for Fritz. He married Grand Duchess Catherine in January and his father died in October on the same day Catherine gave birth to their first daughter. 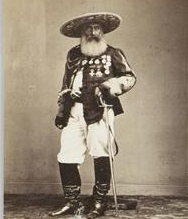 Fritz became a father and a king on the same day, taking the name of King Wilhelm I. Upon taking the throne he worked quickly to simplify things and replace most high officials. 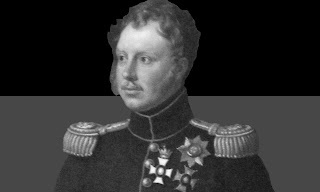 That was also the bitterly cold “year without summer” and the famine and hunger this caused led King Wilhelm I to devote himself to agricultural improvements while Queen Catherine focused on charity for the poor. The economy of Wurttemberg rebounded, in no small part thanks to the new farming and educational initiatives pushed by the King and the work of the Queen to lift people out of poverty. From the brink of disaster the Kingdom of Wurttemberg became a highly successful country. 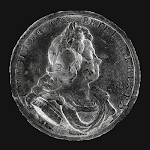 Unfortunately, despite early promise, King Wilhelm was a less the faithful husband which was all the more sad in that Queen Catherine died in 1819 not long after the birth of their second daughter. 1820 saw the King married a third time, to the Duchess Pauline, his cousin, who gave him three more children; two daughters and (the middle child) a son and heir. During the same period, Wurttemberg became a constitutional monarchy, which King Wilhelm I was originally not happy about but he finally approved a document which reserved considerable powers for the monarch. After the 1830 July Revolution in France, liberalism began spreading across Europe and Wurttemberg no less felt the changes with liberals coming to dominate the government, which embittered relations with Prussia and Austria. 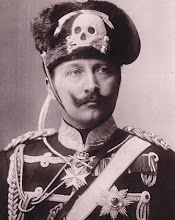 The King worked to improve relations with Prussia and as the economy continued to improve was able to lower taxes and pay off national debts. However, a bad harvest caused an economy downturn that made Wurttemberg susceptible to the radical leaders of the Revolutions of 1848. 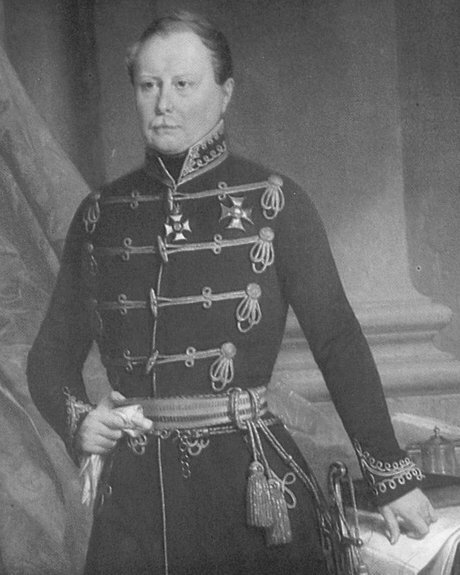 King Wilhelm I played his hand carefully, holding back on shutting down the liberal assemblies until it was absolutely necessary and, in the end, Wurttemberg emerged from the crisis in better shape than many others. Once it was all over the King had become all but a confirmed reactionary, referring to elections as a “periodic fever” he did not wish his subjects to fall victim to. His final years saw increased development (such as the first railroad in the country) and a policy of neutrality as well as reestablishing relations with France, by then under Emperor Napoleon III. 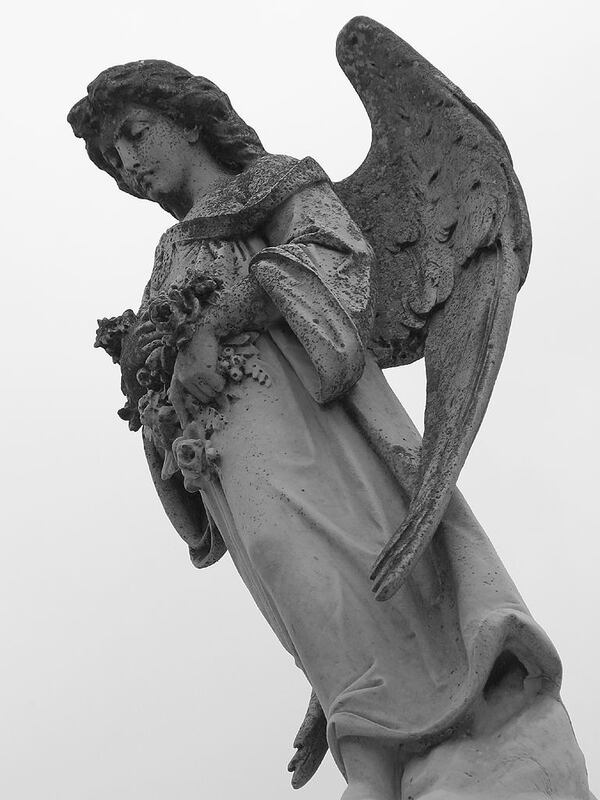 He died on June 25, 1864 at the age of 82. For all of his personal shortcomings he died a respected leader of considerable ability who accomplished a great deal for his country. America and Japan, Who Wanted War? It was last Saturday, December 8, 1941 that the United States and the Republic of China (or at least the leading faction claiming power) declared war on the Empire of Japan in reaction to the devastating attack on Pearl Harbor, Hawaii. The first questionable thing that should jump out to the public about that is that China, which had been engaged in hostilities with Japan for most of the last decade, was not at war with Japan already. Why do you suppose that was? We’ll get back to that in a moment, but the first, preliminary fact which must be addressed is whether or not this was a just action on the part of the United States. To even pose such a question will outrage not a few. The United States had just been attacked and had most of her Pacific fleet bombed to bits. 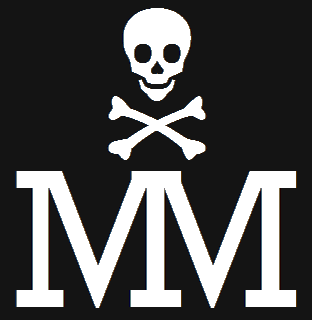 However, I have often been challenged, as a monarchist, on the subject of World War II, specifically as it relates to the Empire of Japan as that was the last time that the United States went to war against a monarchy (and actually more than one of course, but few realize it). 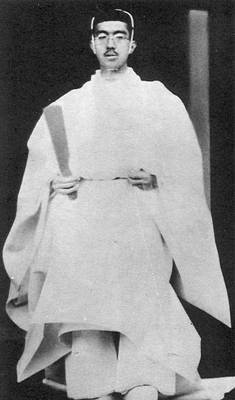 Two of the three main Axis powers in World War II were monarchies but since Mussolini so obviously dominated Italy, the King there is usually ignored, but in the case of Japan, U.S. propagandists early on singled out the Showa Emperor as the great villain, not because he was actually managing all policies in Japan, but mostly because the U.S. propagandists wished to highlight the Japanese monarchy as something backward, foreign and creepy. Since Japan was not a dictatorship like Germany, but was a constitutional monarchy with several changes in government leadership and prime ministers throughout this period, the Emperor was the only consistent figure that the U.S. could label as the “bad guy” comparable to Hitler and Mussolini (though later Prime Minister Tojo would be used to fit the bill). So the war with Japan has often been brought up to me as the challenge against monarchy that cannot be refuted because World War II was the “good war” and President Roosevelt was one of the greatest American presidents and so on and so forth. In my book, FDR was one of the worst presidents in American history, partly because of the actions listed here. As for World War II being the “good war” I have no sweeping statement on the subject. Some people think no wars are ever “good” but I am not one of them. However, even World War II was not as clear-cut as some people think. The fight against Hitler meant an alliance with Joseph Stalin (who actually killed more people than Hitler did) and ended with half of Europe being consigned to slavery behind the Soviet “Iron Curtain”. Likewise, in the Far East, it meant the expansion of communism and gave rise to many brutal dictators and many bloody civil wars as well as ending with a nuclear attack that took the lives of hundreds of thousands of innocent civilians. Roosevelt could have made an argument for U.S. intervention in the war in Europe against Hitler. There were circumstances of course, but Hitler had conquered Poland, Denmark, Norway, The Netherlands, Belgium, Luxembourg, France, Yugoslavia and Greece so a case could be made that he was a menace to world peace and needed to be stopped. However, Japan was a completely different story. 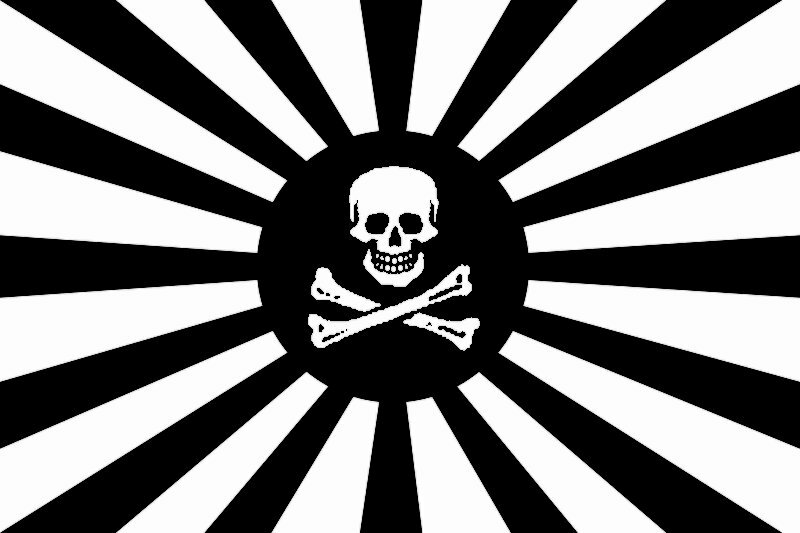 By that same point, the Empire of Japan had made no hostile moves against any neutral or Allied powers. 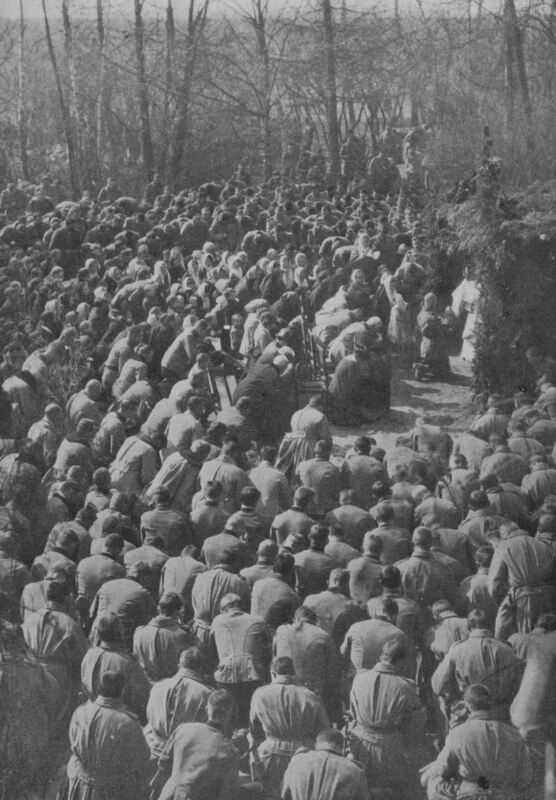 Japanese forces were occupied in fighting the Chinese, as they had been for years, and even the fact that America, Britain and others were funneling money, weapons and even personnel to help the Chinese had not prompted Japan to take any action. Even China had not admitted that their “trouble” with Japan was an actual war, mostly because no one faction wanted to take the risk. The nationalists and the communists both hated each other as much if not more than the Japanese and when Japanese forces occupied Manchuria the republican government, so bitterly divided among itself, made no official effort to defend the region. In any event, from a legal standpoint, according to China as well as Japan, there was no “war” in the Far East at all. Japan had made no aggressive moves against anyone and even the “occupation” of French Indochina (actually only a few bases in Vietnam) was done with the permission of the French government in Vichy which the United States itself still recognized as the legal government of France. 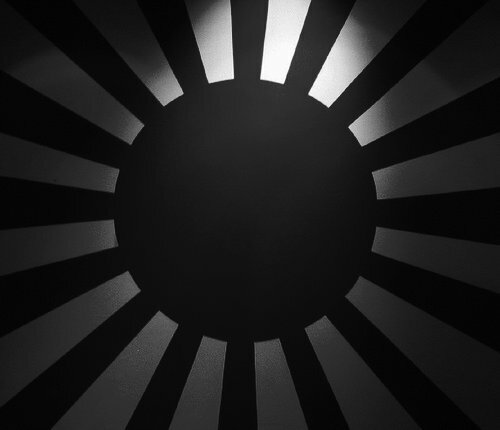 Hitler was attacking countries left, right and center but Japan certainly was not. Roosevelt, however, did first involve himself in World War II in Europe but only around the spring and summer of 1941. The summer of 41 was of course when Hitler launched his invasion of the Soviet Union. President Roosevelt had been the first U.S. President to recognize the Soviet Union as a legitimate government by the way. FDR took such measures against Germany that he told the American Ambassador to France that conflict with Germany was “certain” and only waited for Hitler to cause some incident that FDR could point to in order to gain public support for the war. However, Hitler refused to bite and there was not much the President could do to “get at” Hitler directly. However, unlike Germany, Japan was an island nation that depended on resources and raw materials imported from abroad to survive. He could wage an economic war against Japan that would back them into a corner and force them to strike the first blow, allowing FDR to be “forced” to take the U.S. into the war against Germany as well as Japan. 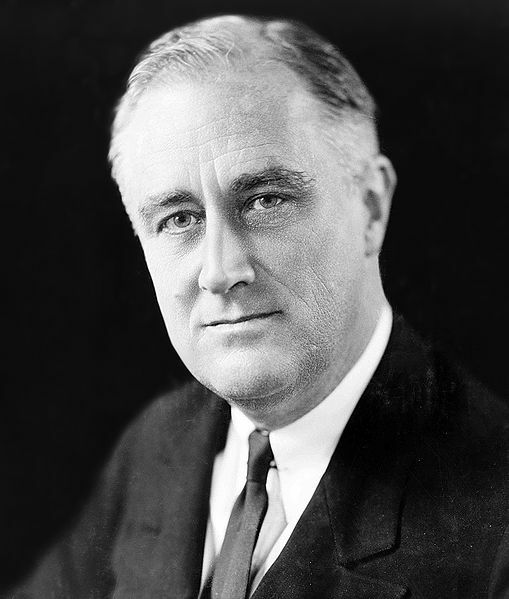 In the summer of 1941 FDR enacted a number of anti-Japanese policies which he knew would force Japan to respond. It was a conflict he wanted and not the Japanese who knew full well that any war with the United States would be disastrous at best and most probably end in their defeat. 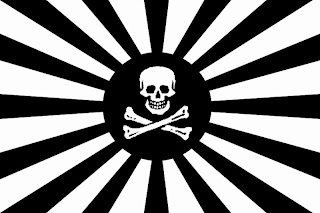 The last thing Japan wanted to do was to fight the United States. Most historians have long agreed that the Japanese were increasingly desperate to negotiate some sort of settlement with the United States but we now know that Roosevelt and Secretary Hull refused to negotiate at all. Japan would offer compromises and concessions which the Roosevelt administration would counter with even more demands. When Japan decided that, after a certain point, war would be their only option, Roosevelt broke off the negotiations, hoping for that very calamity. His own Attorney General said that FDR told him he was hoping for some “incident” in the Pacific that would unite the American people in support of his administration and for going to war (a war he had promised to keep the U.S. out of when running for reelection, but, hey, Wilson had done the same thing in WW1). There really should be nothing “new” or “controversial” about any of this. Admirers of FDR even praise him for doing this. There is really no room for debate on the point any more that the embargo FDR put on Japan, and he persuaded the British government and the Dutch government-in-exile to do the same, were intended to force Japan to either surrender their national sovereignty and control over their own affairs or to launch an attack on the United States or one of the Allied powers. All of this was undertaken against a country that had made no aggressive move against any foreign power aside from China who they were already fighting and had been for some time. FDR’s soon-to-be ally Joseph Stalin had invaded more foreign countries than Japan had, having occupied Mongolia, attacked Finland, conquered Estonia, Latvia and Lithuania and who had joined Hitler in the partition of Poland. None of these facts are in dispute. FDR and members of his cabinet had long advocated the use of sanctions against Japan to thwart their progress and, it must be said, their economic competition with the United States for control of the vast markets of China. There is no doubt at all that FDR intended to use economic measures to force Japan into an impossible position. There is no doubt that the administration knew that Japan was going to launch an attack and, since they had already broken the Japanese naval codes, there is no doubt that they knew Pearl Harbor would be a target. 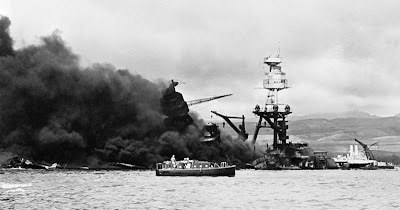 There is no doubt that Washington DC knew but failed to warn the commanders at Pearl Harbor that an attack was eminent on the morning of December 7, 1941 just as there is no doubt that the Japanese government, including the Emperor, intended for a declaration of war to be given at least half an hour before the attack was to take place. It was only due to a poor typist at the Japanese embassy that this did not happen, yet it was portrayed as a sneaky, underhanded, “surprise” attack by the FDR administration. I cannot stress enough that there is no disputing these facts. Even the BBC did a special documentary recounting how the “surprise attack” on Pearl Harbor was no surprise at all. Unfortunately, very few people choose to point these facts out. Today it is largely the libertarians who are isolationist and against any intervention under any circumstances, that will even talk about these facts. Some also make the mistake of attributing it to FDR being an Anglophile. If only that were true! On the contrary, FDR made it perfectly clear that he considered the dismantling of the British Empire a top priority, second only to the defeat of the Axis. It seems to me that if FDR admired anyone that was fighting against Hitler at that time it was Joseph Stalin. FDR was always suspicious of British motives but never of Stalin, famously saying that Stalin was at least “not an imperialist”. By the time the war ended the British Empire was on the road to collapse while the Soviet Union was bigger and more powerful than ever, having been handed all of Eastern Europe and Northeast Asia. It should also be remembered that the entire foreign policy of Japan on the Asian mainland was motivated by anti-communism and their desire to protect themselves from communist expansion. I cannot say that I know for certain what the motivations of Roosevelt were in his intentionally provoking Japan into war. What is certain is that he did it. He wanted war, Japan did not. He could have made a compelling case for intervention in Europe against Germany but he could not have made such a case against Japan. Roosevelt is not an admirable figure, he was certainly not honest with the Japanese, nor was he honest with the British and he was not honest with the American people either. The American troops who went to war on December 8, 1941 did so with courage, valor and righteous ideals. They sacrificed for their country, committed great deeds of heroism and won a hard fought victory. No one can ever, ever take that away from them. The same can be said for all of the British, Canadian, Australian, South African, Indian and other imperial and commonwealth troops who fought for their King and country. None of that is in dispute. Neither, however, is the unfortunate fact that their courage and heroism was matched by the callousness and duplicity of the Roosevelt administration, particularly in regards to the war against Japan which had not wanted war with America, which had enough trouble on hand already and refused to join the German invasion of Russia, which had not wanted to stop being allies with Britain for that matter but which was forced into a terrible conflict that ended with things being worse rather than better for the region as a whole as with Japan standing as the only country in the world (so far) to be subject to a nuclear attack. These things should be considered before holding on to grudges or making sweeping generalizations about the nations involved in World War II. Pleasant or not, facts are facts. "When life seems hard, the courageous do not lie down and accept defeat; instead, they are all the more determined to struggle for a better future." Although a queen consort of Portugal, Carlota Joaquina of Spain is just as, if not more, well known in Latin America than in Portugal. That, interestingly enough, is not due so much to what she did but what she might have done. She was born Carlota Joaquina Teresa Caetana on April 25, 1775 in Aranjuez to the future King Carlos IV (younger brother of King Carlos III) and Maria Luisa of Parma (a granddaughter of King Louis XV of France). Raised in the typical fashion for her time and place, though no one ever thought much of her appearance, it was decided very early on that she would be married to the future King John VI of Portugal as part of an all-out marriage campaign to strengthen Hispano-Portuguese ties. How early an age was it? Well, she was born in 1775 and married in 1785 (May 8, so just after her tenth birthday). Lest anyone jump to horrid conclusions, rest assured the marriage was not consummated until January 9, 1790. 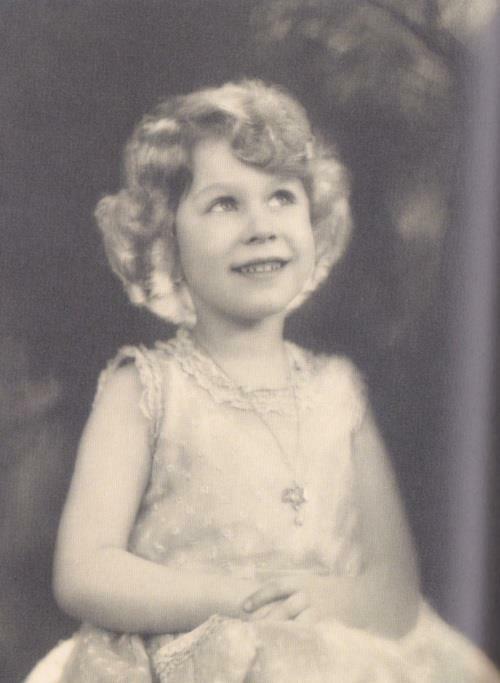 Still, the little girl faced considerable opposition in Portugal where many feared that, by the marriage, Spain was setting up to dominate the country again and force them into a political union. Portuguese officials spent four days subjecting the ten-year-old girl to a battery of tests but she was very bright as well as energetic and passed them all. 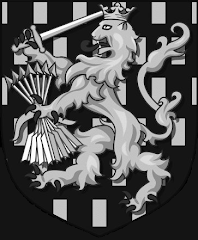 Eventually the couple would have nine children but, at the time, it was not expected that John would ever succeed to the throne as he was the second son of Queen Maria I of Portugal and her husband (by then deceased) King Pedro III. However, when Prince Joseph, his older brother, died in 1788, John moved up in the ranks and was given the titles of Duke of Braganza and Prince of Brazil. Still, there were problems. The future King and Queen still did not attract a great deal of “celebrity” fanfare. 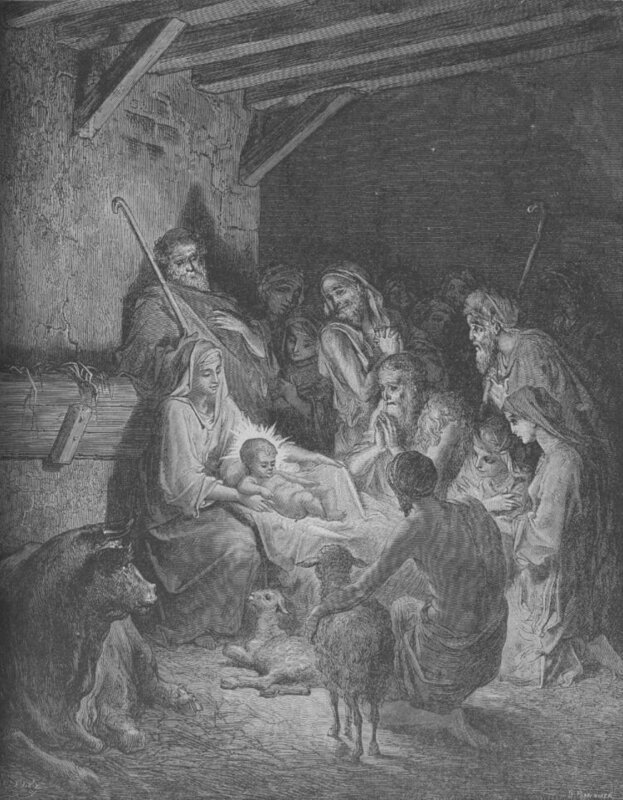 Despite their many children, neither was extremely fond of the other. Few regarded John or Carlota as attractive people as each found the other deficient in about every way. John considered his wife to be lacking in intelligence and decorum and Carlota viewed her husband as boring, pious and overall dull. 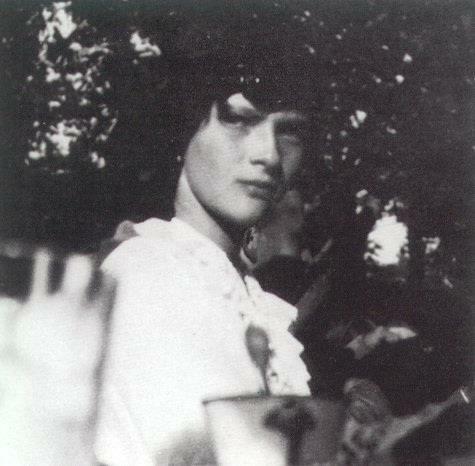 She was outspoken from the very beginning and not the sort to sit quietly in the background. 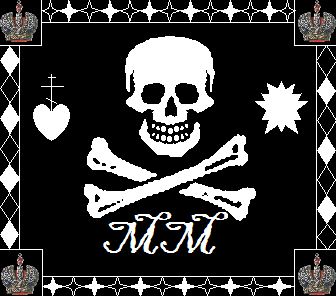 At times, Queen Maria herself had to intervene to try to bring her exuberant daughter-in-law into line. 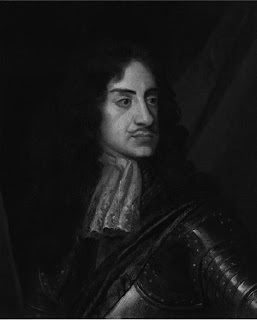 John himself also faced considerable opposition at court from the “Enlightened” faction who had put their hopes in his elder brother but finally had to contend with John who was more traditional; more religious and committed to absolute monarchy as it was established. The difficulties between John and Carlota were so widely whispered about, and their physical appearance held up to such ridicule, that when some of their last children were born people judged them too beautiful to have been fathered by John and assumed Carlota had found someone else for the job. It was nonsense of course though their marital relations were pretty much a matter of simple duty and after the birth of their ninth child they decided they had done enough to secure the succession for Portugal and lived apart thereafter. Ugly rumors were spread about her shockingly immoral behavior, which are not worth recounting, that she was plotting to take over the government, that she was an insatiable nymphomaniac and so on. Certainly she was no saint but the worst of such stories have not a shred of evidence to support them and were almost totally due to the fact that she was unpopular for simply being Spanish in most cases. There was no end to the rumors that Carlota was always scheming to do something terrible to the Portuguese Royal Family to enable Spain to take over the country. She certainly spoke up for the interests of Spain, which is hardly shocking, but most of the rumors were simply that and nothing more. In the end, of course, it was not Spain that proved to be the real threat but France. Under the dynamic leadership of Napoleon Bonaparte, French troops conquered Spain and soon Portugal as well, forcing the Royal Family to relocate to Brazil in 1807. The change in location did nothing to change the ambition of Princess Carlota, who became Queen of Portugal in 1816. With Spain under French control, the vast Spanish empire in the Americas was left in an uncertain position, most still holding to their allegiance to the King Fernando VII rather than Jose Bonaparte but the King was rather missing in action most of the time. Some, of course, also sought to take advantage of the chaos in Spain to promote their own ideas for independence. Carlota thought she could play a part in this and so “Carlotism” became a new part of the political lexicon. Since the King was basically under house arrest in France, Carlota decided that she was the natural representative of “Free Spain” as we might say and tried to gain control of the Spanish colonies in America. Ultimately, this turned into an effort to make Carlota Queen of the Rio de la Plata (the viceroyalty which included what is now Uruguay, Paraguay, Bolivia and Argentina). 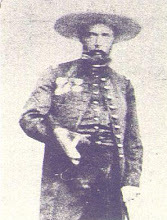 Portuguese-Brazilian forces did annex some territory in this region and Carlota had the support of some prominent local leaders such as the Argentine national hero General Manuel Belgrano, however, the powerful viceroys opposed such a change and the British were against the idea as well. It is understandable but also inviting to imagine what might have happened if so large an area of South America had become an independent monarchy still tied by blood to the Spanish Royal Family. There were plans, or at least rumors of plans, for Carlota to assemble an army and march on Buenos Aires and declare herself “Queen of La Plata” but, as we know, nothing finally came of the grand scheme due to a lack of support from the local elites and the opposition of foreign powers. As the Napoleonic Wars ended Carlota would have to content herself with being Queen consort of Portugal. When she returned with the King and the rest of the family in 1821 things in Portugal had changed dramatically and not for the better. Revolutionary ideas had taken root and were spreading unrest throughout the country. A liberal uprising resulted in the proclamation of the first Portuguese constitution which King John VI promised to support. Queen Carlota was outraged by this and wanted a return to the traditional absolute monarchy. The King was not too fond of the changes himself but felt honor-bound to go through with it. All of the rumors about plots by the Queen to take power were finally realized when she joined with her son, Prince Miguel who was commander of the Portuguese army, to put her husband under house arrest. They hoped he would abdicate in favor of Miguel who would then return Portugal to the traditional sort of government. However, it was not to be as King John VI was aided by the British in regaining power and forcing his wife and son into exile, though the Queen was soon back. The two lived apart and more family divisions were to follow as their son Dom Pedro, who had remained in South America, was proclaimed Emperor of Brazil the next year in 1822. The King was not pleased though the British finally persuaded him to accept the independence of Brazil in 1825. 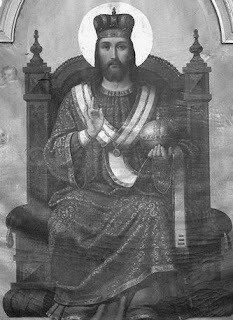 He died the following year, unattended by his wife as Queen Carlota was becoming increasingly paranoid and was convinced that the Freemasons had poisoned the King as part of the effort by the liberal revolutionaries to take power. When the King died Dom Pedro became King of Portugal but abdicated in favor of his daughter so as to remain in Brazil as Emperor. Queen Carlota might have been expected to act as regent for Queen Maria but was not, probably for fear that she would work to displace her. If that was the thinking, it did no good for her uncle and intended husband, Prince Miguel, was declared King of Portugal by the conservative faction before she arrived back in Europe, setting the stage for a civil war. 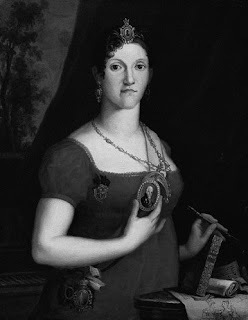 But there would be no more political intrigues for Queen Carlota who died at Queluz Palace on January 7, 1830 at the age of 54 after a very controversial and colorful life. Mad Analysis: Mosley and the "Far-Right"